Cocktail bars provide an excellent space to relax with friends and sip on some expertly-crafted drinks. Unique combinations aren’t the only thing that most cocktail bars are known for, however. Most have delicious cuisine, live music, and plenty of entertainment to make for a memorable evening. Here are the 10 best cocktail bars in California. Come sit back, relax, and step back into time at Melrose Umbrella Co., located in Los Angeles, California. Housed in a building that was erected at the end of Prohibition, this quaint and iconic establishment had one main purpose—to celebrate the cocktail. With an umbrella image that symbolized “wet days to come,” the bar also memorializes James Melrose, an Englishman who was a frequent companion of Queen Elizabeth and carried an umbrella instead of the traditional cane that most men used. This is your new favorite place for neighborhood craft cocktails. If you’re looking for a relaxed atmosphere and friendly bartenders who can build your favorite cocktail, visit Koi Bar & Lounge in San Diego, California. They have an extensive wine list and beer selection in addition to a chic and sophisticated offering of specialty signature drinks from dry to sweet and everywhere in between. Hungry patrons can order delicious food accompaniments at Emerald Chinese Cuisine. Blues and brews is what you’ll find at Blue Note Lounge in Milpitas, California. With a different theme every night, this place serves the best drinks in town. Tuesdays are jam night, when the mature crowd can enjoy live music from popular bands. Thursdays are karaoke nights, and Friday may find you dancing to the Oldies. For a special treat, try one of their famous Cadillac margaritas. This Asian fusion restaurant features creative and unique Asian dishes like garlic noodles and chicken and lobster sliders, they do a great job concocting traditional cocktails like Old Fashioneds. Great atmosphere and friendly servers make the dining experience here even more pleasant, and the music fits the place perfectly. You may have to look for this little eatery, but Holy Water is a perfect place to join friends for classic cocktails and craft beers. They feature a special 11th Hour selection of unique drinks each night that experiment with various mixtures and combinations. Participating customers can suggest their favorite ingredients and have the bartender create a drink designed especially for them. The best part is that you might find a new favorite, but won’t have to pay for a drink that’s an epic failure. It’s a win-win for everyone! The Polk Gulch area of San Francisco has an international night spot and it’s the Rusted Mule located in Lower Nob Hill. With a great go-together comradery of bites and booze, the industrial-chic atmosphere is the perfect backdrop for the cocktails, wine and beer available here. This is a classy place that offers unparalleled drink choices like A Child’s Dream, peanut butter-washed Jack Daniels whiskey with raspberry liquor, white ale, and celery salt. Say what? And if that tickles your fancy, try pairing it with carrot corn dogs, butter poached cumin carrots with hot sauce butter, not ranch. That’s what we’re talking about! With a delightful and delicious focus on local ingredients and a classy upscale atmosphere, Mammoth Rock Brasserie in Mammoth Lakes, California, isn’t just another place to eat and get good cocktails. It’s an adventure for your mouth. Reservations are highly recommended for this very popular dining destination and children are welcome, although a child’s menu isn’t available. You can find expertly prepared dishes with an international inspiration with specialty martinis and locally crafted beers that make great go-together drinks. You can choose small plates like tiger shrimp cocktail or Baja-style fish tacos, or a great sandwich like the Piggy, a slow-roasted pulled pork sandwich prepared with Owens Valley honey barbecue sauce and cabbage slaw. If you want a more substantial meal, they offer a cooked-to-order rib eye steak or spicy Korean beef. Reminiscent of the speakeasy frequented during Prohibition, Haberdasher in San Jose, California, is a basement bar with great taste with traditional cocktails and snacks. One of the things that makes this place iconic is that the bartenders are happy to discuss the history behind the drinks, such as the Hemingway Daiquiri and the Tom and Jerry, but are equally happy to make recommendations like the cucumber raspberry in-house special named the Original Normal Rockwell. W. Wolfskill in Riverside, California, pours out more than just fine cocktails and other spirits. 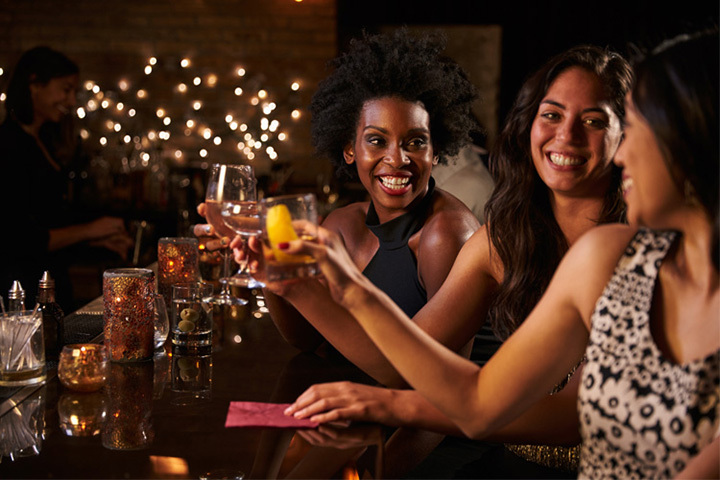 You’ll start experiencing the fun found here the minute you step through the school house door, only to find a sharp and classy atmosphere where knowledgeable bartenders with help you find a new drink or mix up your old favorite. Happy hour provides the chance to try drinks not listed on the menu, so don’t be afraid to ask. Created in the 1960s, this family-owned tropical drink bar will make you think you’re in Hawaii. The island-inspired cocktail bar is a non-smoking facility and is always crowded with people having a great time. They offer signature drinks on specific nights, and the best tiki drinks around. Make sure to try Ray’s Mistake if you’re there on a Wednesday.